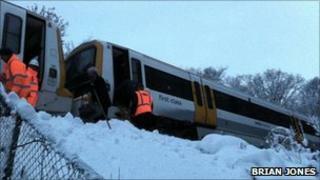 The head of the rail firm badly hit by recent snow has said dealing with the conditions would always be a challenge. Southeastern was criticised by passengers left stuck on trains for several hours or unable to get home for days, as well as lack of communication. Managing director Charles Horton said the south east of England was "very, very badly hit by snow and ice". "If there is very, very heavy snow, we are always going to find it a struggle to provide a good service." He added: "Fortunately, bad weather is only around for a very small part of the year. "The big question is - what is the right balance for investing in equipment to keep the network really free of snow and ice?" Last week, Network Rail was criticised after it emerged that two de-icing trains on the Southeastern network were out of action during the heavy snowfall. Southeastern's regulated fares, which include season tickets, are to rise by an average of 7.8% next month, 2% more than the national average, to take account of extra investment in the franchise. Some season ticket-holders will see fares go up by as much as 12.8%. Mr Horton said: "No one likes paying more for fares but the higher fare rise formula was an inherent part of the franchise."